Please read our terms and conditions before making a booking. Proceeding with a booking will be regarded as acceptance of the terms and conditions below. Bookings are secured with a minimal 50% deposit at time of booking with the balance of the pre-booked accommodation package payable at check in. Discounted accommodation is subject to the discount being claimed at time of booking whether it be on-line in the comments section or by phone. Discount bookings require full payment at time of booking and may not be amended by way of cancellation or transfer. We accept Visa, MasterCard and Cash. The Credit Card is to be in the same name as the person staying. If not, you will need to contact Arcadia Cottages prior to proceeding with the booking online. At check-in, guests are required to show the Credit/Debit Card with which the deposit was made and will be required to provide an assurance of payment of any outstanding costs or charges beyond their pre-booked accommodation package by way of a Credit Card authorisation of $200 or a Cash Deposit of $500. Group bookings or no valid credit card used at check in – please contact Arcadia. In the event that Arcadia Cottages seeks to recover any outstanding costs or charges beyond this amount, guests are required to indemnify Arcadia cottages for all and any fees, costs (including legal costs on a solicitor client basis) and charges associated with that recovery. Travel insurance is recommended for cancellation coverage. Bookings made through a third-party agency are non-refundable. 7 to 21 days’ notice of scheduled arrival time: Cancellation of booking: We will refund you’re holding deposit minus the admin fee if we are able to fully rebook your cancelled dates. Transfer of booking: Admin fee applies. If we are unable to fully rebook your cancelled dates the cost of those unbooked dates will also be added to your overall tariff. Less than 7 days’ notice of scheduled arrival time: the full amount is payable, and the balance will be charged to your credit card. If we are able to fully rebook your cancelled dates at the same total gross booking amount including additional services, we will refund your payment minus the admin fee & costs. Failure to arrive or cancellation after arrival: Full tariff is payable, and the balance will be charged to your credit card. In addition to our normal Terms and Conditions, offers of discounted accommodation are subject to full payment at time of booking and may not be amended by way of cancellation or transfer. Communications with respect to cancellation or transfers must be confirmed in writing (email, fax or letter) and must be acknowledged by us in writing. Arcadia’s cottages and grounds are set up specifically for adult couples and are not available for family groups. The maximum occupancy in any cottage is 2 Adults. 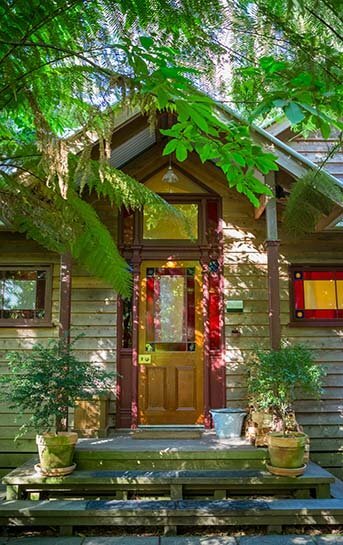 Children are not permitted inside Fernwood, Treehouse or Olinda Cottage. After hours checkin – Late check in fees may apply. Group Bookings and Functions: Special conditions apply, please contact us before booking. May only be used by the recipients of the certificate and are not transferable, refundable (in part or full) or redeemable for cash and not valid on specials. Minimum stays apply on weekends, long weekends, public holidays and over the Christmas New Year period. Gift Certificates must be booked directly with Arcadia Cottages, by phone or email and not through any third party or on-line booking service. Period of validity is 6 months from the date of issue. Extensions may be granted for up to 9 months from the date of issue however a reinstatement fee of $30 / month (or part month) of extension applies. Change of Booking – More than 21 days’ notice before check in date: Booking may be transferable if within the maximum validity period. A $50 admin fee + the reinstatement fee (if applicable) will apply. Less than 21 days’ notice – no changes are accepted. The daily tariff for the period that the room or cottage is unavailable for other guests due to the effects of smoke contamination and damage. The cost of finding alternative accommodation for subsequent guests as a result of the cottage being unavailable. The cost of cleaning, repairing or replacing any item damaged by the affects of smoking or the burning of incense. This may include the cost of additional cleaning, laundering of drapes or other fabrics and the replacement of damaged items. Minimum charge for smoke contamination of cottage is $200. The lighting of candles is not permitted inside any building owned or managed by Arcadia Cottages. We have had several instances in which their use has resulted in fires, damage to surfaces and fabrics from flames, smoke and melted wax. Table lamps and dimmer switches have been provided for mood lighting. The daily tariff for the period that the room or cottage is unavailable for other guests. The cost of finding alternative accommodation for subsequent guests as a result of the damage. The cost of repairing or replacing any damaged item or surface. This may include the cost of additional cleaning, laundering or the replacement of damaged items.Minimum charge for burning of candles is $200. Check In is from 2.30pm to 8pm. A later check in can be accommodated by prior arrangement. An after hours check in fee of $30 per hour after 8pm may apply. Check Out time is by 12 noon unless otherwise stated. A late check out is not available unless confirmed in writing. An unapproved late check-out will incur the following penalty charges. Up to Half hour $50, half to one hour $100, over 1-hour full days tariff. All specials have an 11am check out. Arcadia Cottages will accept a cancellation by you for days with an actual or predicted Fire Danger Index (FDI) of 75 or above (‘Code Red’ or ‘Extreme’) for postcode 3788 (Ref. www.weatherzone.com.au). You must notify us of your intention to cancel stating that this is your reason for cancelling and it must be acknowledged by us. Under these circumstances we will refund in full any deposits already paid by you for that unused accommodation. We reserve the right to close our operations and in effect cancel your booking with us in the rare event that we deem it necessary for your safety or because of an inability to operate due to circumstances beyond our control. This may include significant bush fire danger, road closures, an extended power or gas outage or damage to your booked accommodation due to storms or other circumstances. In this instance we will give you as much notice as possible and provide you with assistance in securing alternative accommodation. We will refund in full any deposits already paid by you for that unused accommodation. Information on this website may be altered by us at any time without notice.